One of Terengganu's newer attractions is the Islamic Civilization Park (Taman Tamadun Islam) featuring scaled-down replicas of 22 famous monuments from the Islamic world. It was opened in 2008 on an island in the Terengganu River just 1.2km from the Terengganu State Museum on the outskirts of Kuala Terengganu city. 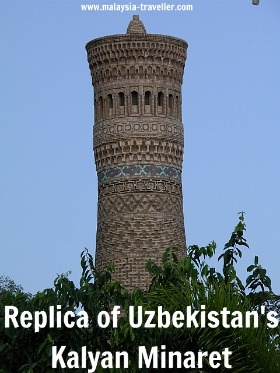 The park claims to provide 'edutainment' and visitors can learn about the spread of Islamic civilization by marvelling at the detailed replicas of 22 famous mosques and tombs from around the world. The park also contains a water wheel and a 3D cinema screening a virtual hajj. 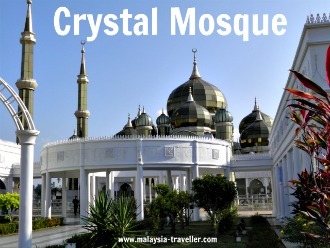 On the same island, but outside the perimeter of the Monument Park is the famous Crystal Mosque, a convention centre, a shopping arcade, food court and river cruise jetty. There is also a lake with paddle boats. Guest houses which can accommodate 6 - 7 guests each are available for rent at about RM400 - RM450 per night. Adults (RM25, RM10 discount for MyKad holders), Senior Citizens (RM15), Children age 7-12 (RM15) and free for children age 6 and below. For drivers, the location is marked on the map on my Top Terengganu Attractions page. Details of bus and water taxi transportation are available here.